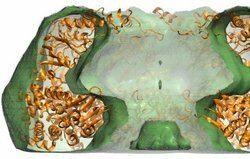 Our lab works towards an integrated approach that combines protein structure determination techniques with prediction methods with the ultimate goal of modeling the structure of large macromolecular complexes with high accuracy. The main focus is on the structural interpretation of low-resolution or sparse experimental data, which alone typically do not suffice to build accurate atomic models. We are developing methods to combine data from a variety of different experiments such as CryoEM, X-ray crystallography, NMR, FRET, and SAXS. Single-particle cryo-electron microscopy (CryoEM) is able to determine three-dimensional density distributions (density maps) of large macromolecules. The resolution ranges from (in few cases) higher than 4 Å to often well below 10 Å. In case high-resolution structures (e.g. from crystallography) is available the goal is to refine the structure to fit into the low-resolution CryoEM density map. For this purpose we have developed the real-space refinement program DireX. We developed the Deformable Elastic Network approach to combine prior structural knowledge with low-resolution data. 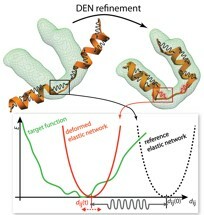 The idea is to adapt an elastic network potential (defined on a reference structure) in a way that deforms only those degrees of freedom that need to be deformed to fit the data but not more. This approach significantly reduces overfitting, which is usually ecountered in low-resolution refinement. Single-molecule FÃ¶rster Resonance Energy Transfer (smFRET) measurements use the non-radiative transfer of energy from a donor to an acceptor dye. By monitoring the relative fluorescence intensities from the two dyes, the energy transfer efficiency can be evaluated for individual molecules. The transfer efficiency is commonly employed to determine the interdye distance. This method has emerged as a powerful biophysical tool to measure the distance between two labeled sites within one macromolecule or between two labeled macromolecules. FRET measurements are most sensitive in the 10-100 Å distance range. With several of such measured distances it becomes possible to build a three-dimensional model and to describe conformational transitions. We developed methods for this purpose and applied them to different kinds of systems from proteins to DNA and RNA. 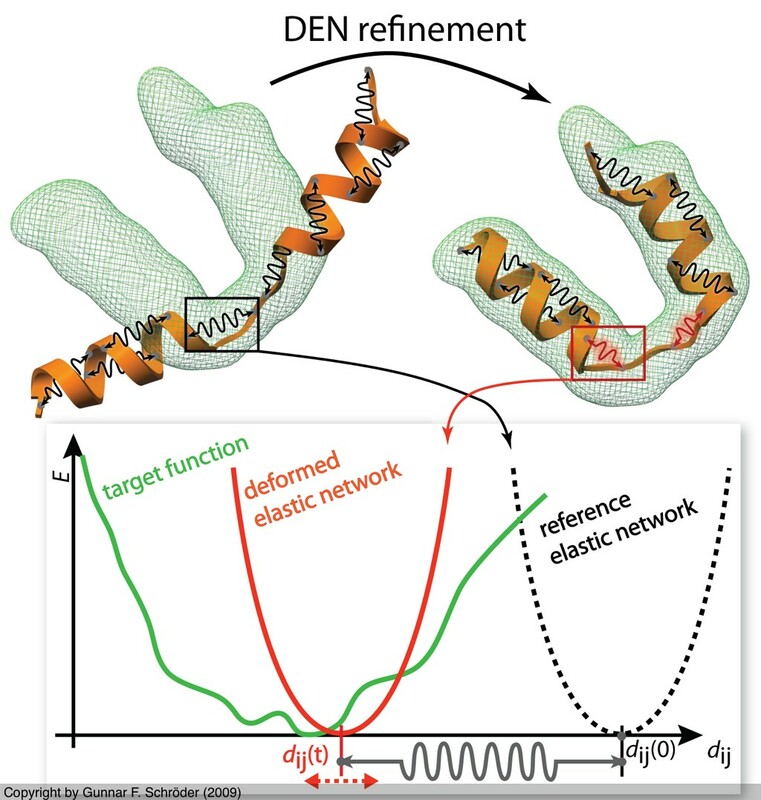 Time-resolved fluorescence anisotropy decay experiments on a protein-attached dye can probe local protein dynamics and steric restrictions, but are difficult to interpret at the structural level. Aiming at an atomistic description, we have carried out molecular dynamics simulations of such experiments. Our simulations describe an Alexa488 fluorescent dye maleimide derivative covalently attached via a single cysteine to the AB-loop of bacteriorhodopsin. Fluorescence anisotropy decay curves obtained from the simulations agree well with the measured ones. 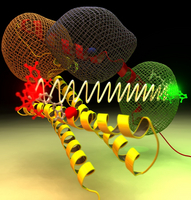 Furthermore, our simulations allowed us to test the usual and inevitable assumption underlying these types of spectroscopic measurements that the attached dye probe does not severely perturb the protein dynamics. 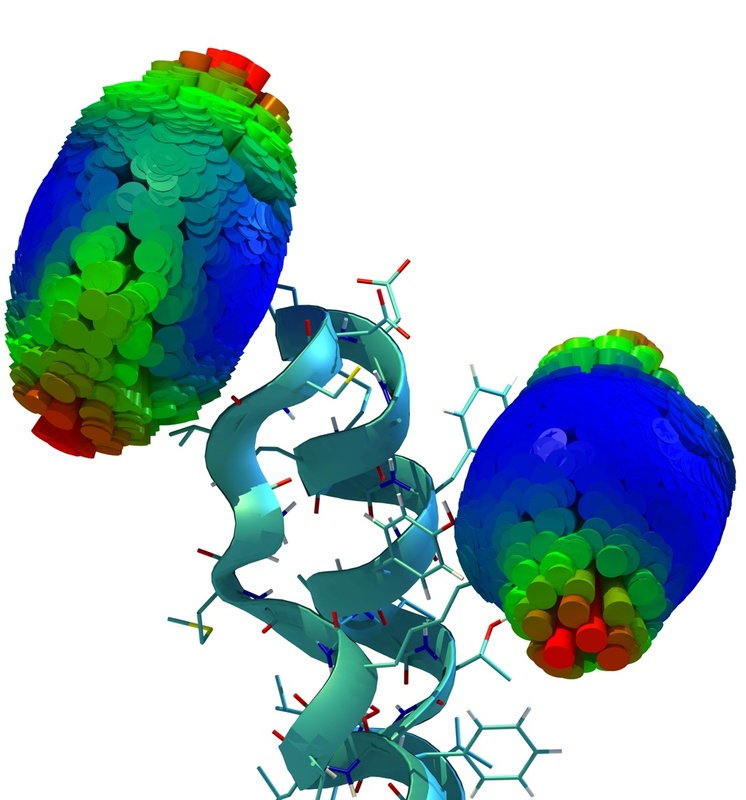 For the case at hand, by comparison with a simulation of the dye-free protein, the perturbation was quantified and found to be small.